Tenants and residents can take heart from what has been won so far at Stretford House in Trafford. In 2010, as part of a refurbishment, a new communal heating system was installed (aka “district heating”) that in this case cost much more, and was not capable of keeping the flats warm. The works to install the new system also compromised the building’s fire safety. Action by the former Chair of the TRA has now brought major improvements on both those fronts, although there is a long way to go. Heating tariffs have been halved. The following account is by Stretford House resident and former Tenants and Residents Association chair Phil Murphy, who is a former Fire Safety Officer with Greater Manchester Fire and Rescue Service (GMFRS). It was more than eight years ago when Trafford Housing Trust carried out a major refurb at Stretford House, a 23 storey single staircase property. Up until that time every flat had a warm air system fed through their own gas meter. It wasn’t expensive and we could all switch suppliers as we paid our own gas bills. The new system, brought into our block and other THT tower blocks, has centralised boilers which feed hot water to heat exchangers in each flat. Tenants had no choice, we had to accept this, although leaseholders could opt out and some did hang onto their old warm air systems. When the new system was to be brought in, they told us it would halve what we had to pay for heating and hot water. That is not how it worked out. . When the heat output of the new heating system was specified it was expected that it would be working in flats with new insulation and new windows. Following completion of all of the works except the windows and cladding, the programme was discontinued. Not only did this leave residents with a system operating without the expected insulation improvements, but the system was also not functioning correctly for many flats. It took three years to get the heating system working correctly. It required the installation of new major pumps (indicating an incorrect specification in the first instance), new filters, and the whole system needed to be flushed out to remove debris from inside the system. Many of the complaints over the three year period were not formally logged as complaints. At one point there were so many issues arising that the trust’s heating manager was in the foyer noting issues by hand, these issues were never logged as repairs. This means the trust’s published repairs and complaints for this period remain wildly inaccurate and don’t not reflect the nightmare tenants in Stretford House were enduring. For us, the fight was draining. During that period the system wasn’t operating as it should. It struggled to heat flats that were supposed to have improved windows and insulation. This resulted in some tenants having their heating on permanently and yet reporting that their flats never reached an acceptable temperature. Having the heating on for extended periods saw tenants receiving vastly increased energy bills. Meanwhile the energy charges set by the trust ignored the issues, and having initially priced the unit cost at 2p/kwh, providing the energy savings that was promised to tenants before they were forced to accept the new system, the trust now had a monopoly on this energy (residents are unable to switch suppliers) and swiftly doubled the cost to 4p/kwh without even bothering to inform residents. Falling gas prices meant that residents were now paying significantly above the average consumer rate being charged by the big six domestic energy suppliers. The following year they doubled it again to 8p/kwh. In addition, in installing the system, the contractors had totally trashed the compartmentation that was supposed to protect us from the spread of fire. There were holes in every flat, and between flats, that fire and smoke could come through. In addition, some residents became so concerned about bills that they were relying entirely on the small fan heaters that the caretaker was distributing free of charge in acknowledgement of the issues. Even though this presents a fire risk residents were not advised of the increased risks. As it happens, I am a former fire fighter and fire safety officer, and I was painfully aware of the danger. Inspired by the work of Stuart Hodkinson and Fuel Poverty Action, I wrote to my MP Kate Green detailing my concerns surrounding the adequacy of fire risk assessments, especially compartmentation that had been penetrated throughout the block with the installation of the new heating systems’ pipework, and the energy prices being forced on residents by the energy-monopoly landlords. Having experienced the complaints procedure I took a different route and used my fire engineering knowledge to compose a fourteen page forensic analysis of the fire safety problems I suspected might exist. I gave it to a GMFRS Fire Safety Officer who demanded immediate improvements. It turned out that everything in the report was correct. This was after Grenfell. Heating price halved: At the start of this year the independent expert concluded that the price could not be justified. The price was dropped from 8p/kwh to 3.9p/kwh and all residents received a refund amounting to the unnecessary charge they paid for the last 12 months (in most cases this ranged between £200 and £350). However residents had been paying the super-charged energy rate for five years. 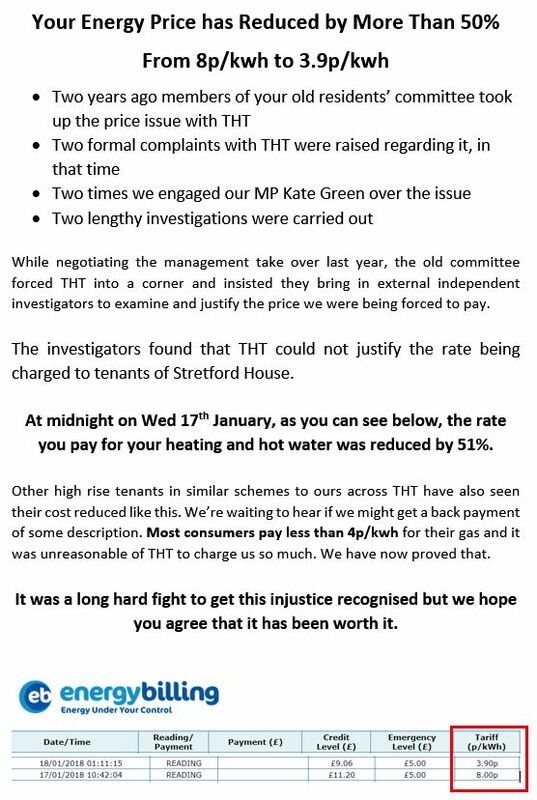 While they await to see whether they’ll receive the full refund to which they are entitled, Trafford Housing Trust have brought in another independent consultant, presumably in an attempt to justify charging residents far in excess of what the trust are paying for the energy. Residents are wondering whether they’ll get the money they are owed, whether other tenants across the trust have also received a refund to which they are entitled, and whether they’ll have to switch to fan heaters again that carry an increased fire risk and are expensive to run but are at least easily controlled to limit their energy bills.